Comet Lulin was still only about 11th or 12th magnitude when Michael Jaeger took this image on Sept. 2, 2008. 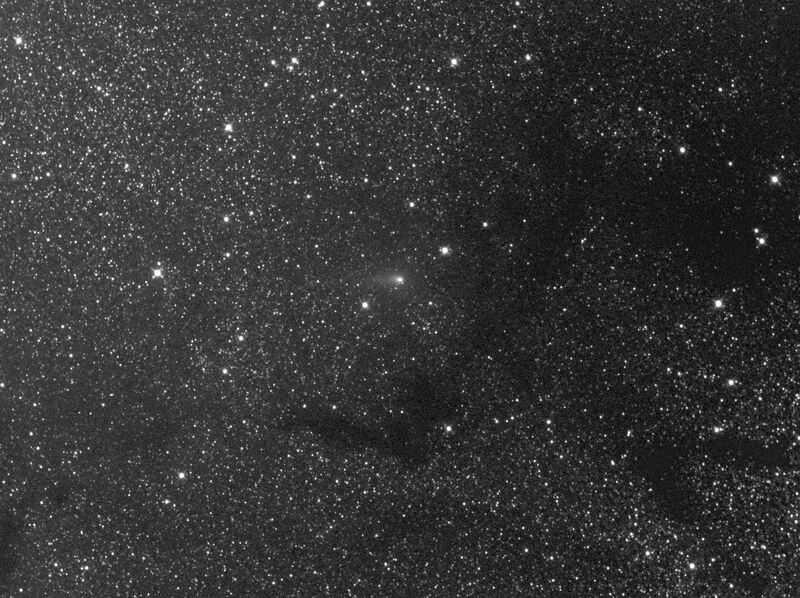 He used an 8-inch f/2.8 ASA Astrograph with a SXV H9 CCD camera for this stacked pair of 4-minute exposures. Click the above image for an enlarged view! Image by Michael Jaeger, Courtesy Sky and Telescope Magazine. 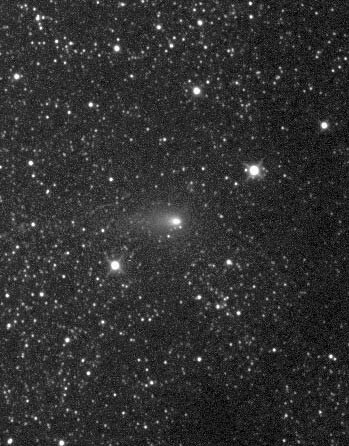 Comet /2007 N3 is now making its way into the winter skies and may be a fairly bright object suited for telescopic and visual viewing over the next few months. It was discovered by 19-year-old Quanzhi Ye, a student at Sun Yat-sen University in China using a 16" telescope at Lulin Observatory on 7/11/2007. Also known as Comet Lulin, it will make its closest approach to the sun on 1/9/2009 and is expected to brighten as it moves away from Sol and toward us. Though no one knows exactly how bright it gets as it passes by us, it is expected to be at least 6th or 7th magnitude as February begins. Moving along a path that is very unusual, the comet almost parallels the Ecliptic, the celestial "path" of the sun as it moves outward. It will be moving very fast and at its closest approach to earth on 2/24/2009, Lulin will be about 61 million miles away. It will at that time be traveling along at over 5 degrees per day against the night's sky! Afterwards, the comet will slowly fade as it pulls away from us. However, Comet Lulin will pass within 2 degrees north of Spica on 2/16/2009, next less than a degree south of Saturn on 2/23/2009, and 2/24/2009, and then a degree south of M44(2632) the famous Beehive open cluster in the constellation Cancer on 3/6/2009.On these dates there will be great photographic opportunities to catch the comet in the same field of view with these objects. Comet Lulin will slowly fade as it moves westward into the constellation Gemini, and the evening twilight of the spring.